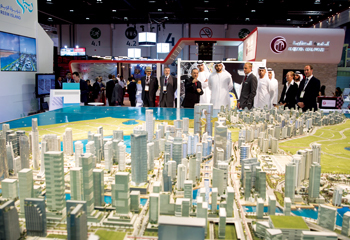 THE upbeat sentiment of Abu Dhabi’s real estate market has been underlined by new exhibitors taking part in the UAE capital’s largest property event this year, as the residential, office, retail, and hotel sectors all gear up for double digit growth in 2014. According to global property experts JLL’s Q4 2013 Abu Dhabi Real Estate Overview report, 22,000 residential units are expected to be delivered in Abu Dhabi this year, a 10 per cent increase year-on-year, bringing the total number of units in the emirate to 240,000. Delivery of office and retail space for the remainder of 2014 is also expected to grow by 16 per cent and 20 per cent respectively, the report added, with 507,000 sq m of office space and 388,000 sq m of retail space due to be added to existing stock by the end of the year. The fast-growing market bodes well for dozens of leading property developers at the eighth edition of Cityscape Abu Dhabi, which is set to welcome more that 120 new and returning exhibitors eager to tap into the renewed investor confidence in Abu Dhabi and across the GCC. Taking place from April 22 to 24 at Abu Dhabi National Exhibition Centre (Adnec), the event is held under the patronage of General Sheikh Mohamed bin Zayed Al Nahyan, Crown Prince of Abu Dhabi and Deputy Supreme Commander of the UAE Armed Forces. Among the headline exhibitors returning in 2014 having not participated last year are Tamouh, Baniyas, and Masdar, while first-time exhibitors include Farglory and the event’s official broker Flash Properties and headline sponsor Ejadah Asset Management Group. After establishing itself as Dubai’s foremost community solutions provider covering residential, commercial, retail, hospitality and mixed-use developments, Ejadah now has the Abu Dhabi property market firmly within its sights. Billy Daly, CEO of Ejadah Asset Management Group, said: “The demand for real estate and community solutions has been steadily increasing in Abu Dhabi, and as a leading provider with a strong track record in Dubai, we aim to meet rising demand in the UAE capital for high-quality, world-class services. Other key exhibitors at Cityscape Abu Dhabi include platinum sponsors Emirates Steel and Official Mortgage Provider Abu Dhabi Finance, while a strong international contingent is led by major developers from Turkey, Egypt, the USA, Russia, the UK, and Oman. An important highlight of Cityscape Abu Dhabi 2014 is the ‘Abu Dhabi Market Overview’ executive luncheon on the opening day (April 22), hosted in collaboration with JLL.